Crickets are considered a symbol of good luck in several ancient cultures. Going back as far as 500 B.C., people have esteemed the cricket’s song and have even kept them as pets to listen to their music daily. The insects are thought to be able to signal a good harvest. They were even considered great protectors because they would stop singing whenever someone or something approached. While this legend somewhat persists, a cricket infestation is anything but lucky. The pests chow down on fabrics and leave holes in your clothing, carpeted floors, and wallpaper. What in the World Is a House Cricket? A house cricket is a light, yellow-brown insect that has three dark bands on its head. They measure around 3/4 to 7/8 of an inch long and have slender antennae that are frequently longer than their bodies. This type of cricket also has wings that lie against their backs. A juvenile cricket will look like an adult without wings. Fortunately for you, these insects don’t typically lay eggs inside homes or businesses – yet, they’re pretty good at entering as adults. 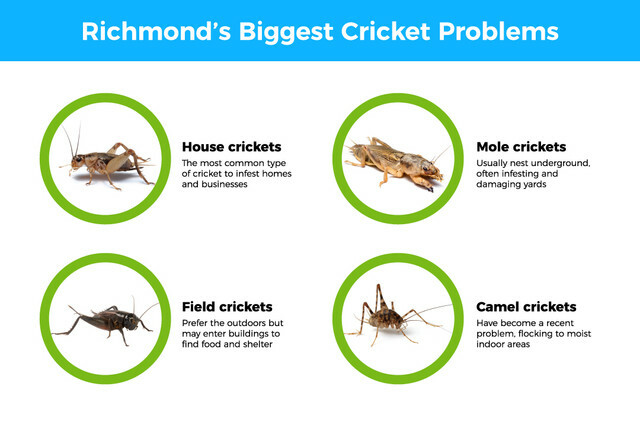 Other cricket types found in Richmond, VA and the rest of the state of Virginia include mole, field, and camel crickets. The mole type measures from 1 inch to 1 1/4 inches long. Fitting their name, they’re often unseen because they prefer to stay underground. The field kind is a little longer than the house variety, and they tend to be black, grey, or dark brown. Camel crickets are one of the largest varieties found in homes and businesses – they measure from 1/2 to 1 1/2 inches long. The camel cricket species is becoming a problem on the Atlantic Coast, including our state of Virginia. Named for their humpbacked look, they like to make their home beneath moist leaves, rotting logs, and stones. This pest can live for one to two years, and like their house-dwelling cousins, they are light brown in color. The camel cricket species does not have sound-producing organs, which means that they don’t chirp. Adult camels don’t have wings, but they do have long legs that allow them to jump a good distance. To prevent camel crickets from infesting your Richmond, VA home or business, get rid of any areas of moisture that are inside or outside the structure. You may want to invest in a dehumidifier to prevent moisture from building up inside. Experts also recommend sealing up any points of entry around your home or business. Simply getting rid of stuff that allows moisture to form and remain is extremely helpful. Moisture forms and stays put in yard debris and woodpiles. What Are the Signs of a Cricket Infestation? The most noticeable sign that you have a cricket infestation in your home or business is seeing one crawling around. The insects are attracted to warm, moist environments inside a structure. Chirping noises are another sign that they have decided that your residence is a good place for them to live as well. When a cricket is in your house and starts chirping, it will sound a little too loud and a little too close to be outside. The male bugs make this noise to attract females, and because the pests are nocturnal, they usually chirp at night. While crickets may have been good luck symbols to people in the past, today they are mainly a noisy nuisance. When the insects infest in large numbers, they may cause damage to clothing as well as other fabric pieces like sheets or drapes. 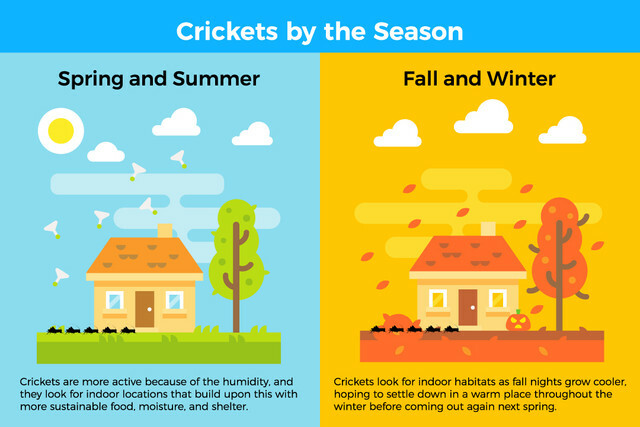 A cricket is most likely to enter your home or business in the fall because of the colder nighttime temperatures. The bugs will be searching for a warm place for the winter. These insects will be attracted to bright lights, so if you have lights on your porch or garage, then an infestation may be more likely. A cricket can enter your home through cracks in doors, window frames, siding, or the foundation. They may also walk right in if you leave doors open from time to time. When a cricket enters your home, it’s probably searching for food or more comfortable digs. Sometimes, they wander into a home because they’re just exploring their surroundings and they happen to be in your area. During the day, the pests require a good place to hide to avoid drying out and becoming overheated. The best way to get rid of these pests, in addition to reducing moisture sources, is to maintain your exterior spaces regularly. Be sure to mow the lawn, weed your flower beds and shift woodpiles away from the foundation of your home or business. Make sure that your basement and crawl spaces are well ventilated, and consider swapping outdoor lighting to yellow bulbs or sodium vapor lamps. The pests aren’t as attracted to these kinds of lights. Conduct an interior and exterior inspection of your Richmond, VA home to look for ways that the bugs can get in. In particular, search for holes or cracks in your foundation and window and door frames. If there’s just one or two crickets hanging out in your house, you can probably just wait it out. These are pests that usually die in the fall and winter. However, they are noisy bugs (ones that attract pests like rodents and spiders), so if there’s a cricket living with you that won’t let you sleep, then it’s time to contact the pest professionals at Connor’s Pest Control. Our professional cricket control technicians will inspect the interior and exterior of your home or business to develop a personalized treatment plan.